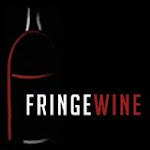 Today marks Fringe Wine's fifth foray into the wonderful region of Piemonte and we have plans for at least five more posts on grapes from this region in the not too distant future. More so than any other region in Italy, Piemonte really delivers the goods not only in regard to the breadth of varietal offerings, but also in regard to their quality as well. Today's wine is from a grape called Ruchè (sometimes spelled Rouchet) which, like quite a few obscure grapes, has a bit of mystery surrounding it. Some people believe that it is native to the hills around the town of Asti while others believe that it was brought down from Burgundy in the 18th Century. I can't find any definitive genetic or ampelographical studies done on the grape, so at the moment, it seems like it's a mystery awaiting further evidence to solve. The former explanation seems the most likely to me because as far as I know, the grape is not cultivated anywhere outside of this tiny area within Piemonte, though the alternate spelling "Rouchet" does give me a little pause, as it looks a little French to my eyes (the grave mark over the e [è] is a product of the Piemontese dialect and if it went the other direction [é], would be from the French, according to a conversation I had with Randall Grahm on Twitter). The Oxford Companion to Wine champions the latter explanation, so feel free to draw whatever conclusions you want. Where ever the grape is actually from, it finds its home today on about 40 hectares of land around the Italian village of Castagole Monferrato in the Asti province of Piemonte. The Oxford Companion to Wine describes Ruchè as "relatively obscure," which seems like a bit of an understatement given the paucity of land devoted to it and the fact that there are only about 22 producers who make wine from the grape. It does have its own DOC, which was established in 1987, but due the scarcity of plantings, the production figures here are very low. The DOC regulations do allow for the addition of up to 10% Barbera or Brachetto, but that doesn't really help to stretch the juice that much. Interest in the grape has traditionally been a local phenomenon but a few examples are starting to make their way over to US shores. You'll still have to do some pretty serious hunting to track down a bottle, though. The natural inclination one has when presented with the unusual is to try to compare the unusual object to a more common object in order to frame it in some sort of context that one already understands. The interesting thing about Ruchè is that the comparisons people try to make seem to be all over the map. There are some people who compare it to Nebbiolo due to its intense, flowery aromatics. Some compare it to Pinot Noir because of its supple character and intense aromatic profile while others point to Dolcetto as the closest analogue thanks to its friendly, fruity nature. The grape it most closely resembles for me is actually Lacrima di Morro d'Alba. Both of these grapes are explosively, almost overwhelmingly floral on the nose and both have soft, ripe fruit as their defining characteristics on the palate. I was able to find a bottle of the 2007 Vigna del Parroco Ruchè di Castagnolo Monferrato for about $26 from my friends at Bin Ends. In the glass, the wine was a medium ruby color that was pretty steady all the way to the rim. The nose is very aromatic with baking spice, black plum, stewed tart cherry, rose petals, violets and a kind of vegetal/herbaceous flower stem aroma. On the palate the wine was medium bodied with acidity on the higher side of medium and medium tannins. There were flavors of tart cherry and spiced plum, baking chocolate and espresso and, oddly, a kind of floral taste to it as well. I can't say as I've eaten a lot of flowers but sometimes if I'm in the presence of very strong ones, I get a kind of funny bitter taste in my mouth and that's what I was reminded of here. This wine was extremely good for about the first hour, but as it sat, the floral aromas and flavors got much stronger and started to turn much more bitter and vegetal. By the second day, this kind of tasted like what I imagine chewing on a geranium stem would be like. I would definitely recommend this wine with the caveat that you want to work your way through bottle as quickly (and responsibly) as you can before the vegetal notes in this have time to really take hold. When this wine was good, it was very very good with really lovely plummy spice and just enough perfume to keep your imagination active. Pelaverga is a tough grape to research. My first line of attack, The Oxford Companion to Wine, has exactly one sentence about it: "pale, rare, red grape of Piemonte making slightly fizzy, strawberry-flavoured wines." Pretty much all of my other books on Italian wines make no mention of the grape whatsoever. Perhaps if it was grown in a less prestigious area, more writers might spend a little more time on it, but since it's grown exclusively in Piedmont, the land not only of great Nebbiolo but a wealth of other interesting indigenous varieties, it doesn't get very much attention. It's definitely an obscure grape, grown in incredibly minute quantities in the Verduno and Saluzzo regions of Piemonte. Verduno is located within the Barolo region and is just a few hills over from the famed Barolo site of La Morra, while Saluzzo is a little further west, on the foothills to the Alps. There may be two different clones of Pelaverga grown in these two regions (Piccolo in Verduno and Nero in Saluzzo) but I'm not entirely sure. In any case, it has a very long history in the Piedmont region, dating back to the 15th Century, but it was mostly used as a blending grape and, occasionally, as a table grape. Pelaverga has been playing the starring role in wines only over the last few decades, and with the granting of DOC status to Verduno in 1995, there was a bit of a renaissance for the grape. The DOC regulations stipulate that a minimum of 85% Pelaverga be used for the DOC designation (though I believe most producers use 100%). Jeremy Parzen over at Do Bianchi has a cool story about how Pelaverga became a buzz wine in New York due to a mention in the NYT in 2006. It hasn't exactly taken over the world since then, but it has made some inroads to the US market. The name of the grape is also kind of interesting. If you take the word apart, "pela" is the Italian verb "to peel," and "verga" means branch, so it means something like "branch peeler." Jeremy postulates that the name has something to do with a viticultural practice used to train the vine itself. But he also notes that "verga" is the Spanish word for male genitalia, and that the people of Verduno claim that the grape acts as an aphrodisiac. I can't say that I noticed any particular changes when drinking this wine, but like pretty much all wines, it certainly doesn't seem to have any deleterious effects in that department. I was able to find a bottle of the 2009 "do ut des" (which essentially means the same thing as "quid pro quo" I guess) Pelaverga from Ascheri for about $19. When purchasing this wine, I was led to believe that it would be a little frizzante, and the research I did seemed to indicate that most Pelaverga is sold slightly spritzy, but this wine was totally flat without even a hint of effervescence. The wine had a pale ruby color in the glass with little saturation and a shy nose of strawberry, raspberry and tart red cherry. On the palate, the wine was light to medium bodied with high acid and virtually no tannin. There was light strawberry and red cherry fruit with a kind of wet leather mustiness to it. The alcohol here is a pretty hefty 14.5%, but it doesn't particularly stick out when drinking. Overall, this is an enjoyable lightish red wine that reminded me somewhat of Schiava. I tried this with a slight chill to it, but quickly abandoned that plan as it seemed to bring out a harsh bitterness to the finish. I would really love to try one of these with a little spritz to it, but it's understandably difficult to locate. 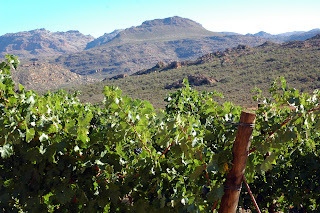 Today marks Fringe Wine's first visit to South Africa, and as I was getting ready for this post, I started thinking about why I have so few posts on many of the "new world" wine countries. I have zero posts on Chile, zero on Australia and New Zealand, two on Argentina and a handful on the USA. The reason is pretty simple, I guess. 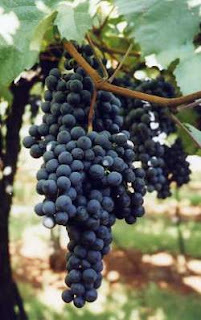 Vitis Vinifera, the grape species used to make virtually all the fine wines on earth, is native to Europe so most of the genetic variety is shown over there. 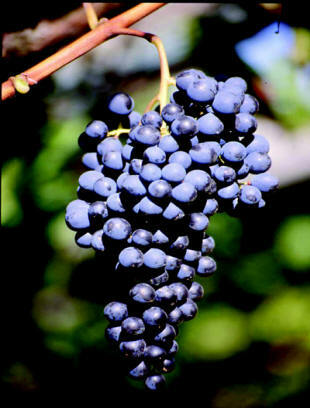 The native grapes of the new world tend to make very bad wine so while these countries may have a wealth of indigenous grapes, they are not considered good grapes for wine production. The wine grapes that are grown in the new world are virtually all imports and if you're going to bother to import something, you're probably going to bring over the grapes that have a record of success not only in the vineyard, but in the marketplace, which is why we tend to see the same grapes over and over again all over the world. People want Cabernet Sauvignon and Chardonnay, not Zweigelt or Bianchello, so that's what tends to get planted in and exported from new world vineyard sites. There are a few exceptions here or there, and I've covered some of them. Bonarda and Torrontes in Argentina and Valdiguié and Blaufränkisch in the US are both examples of unusual European grapes that have found their own little niche in the new world. There are also a number of hybrids available in the US such as Symphony and Landot Noir that have had a bit of success in the US. I suspect that the prevalence of these types of grapes may be higher in the countries they are grown in, but they are not exported in very large quantities to the US market since, as mentioned above, we're pretty much only interested in the big international varieties or varieties that have found a special home in a new world site (Carménère in Chile, Chenin Blanc in South Africa, Malbec in Argentina, etc.). I've had pretty good luck here in the US finding some unusual American wines, but I would guess there probably isn't much of a market in England or France for Rhode Island produced Landot Noir. All of this brings us to today's grape, Bukettraube. As you might expect from the name, this grape is rumored to have Germanic origins (a Sebastian Englerth is purported to have created it in the 19th Century) and its parents are thought to be Silvaner and Schiava Grossa, the lesser of the Schiava clones. An Alsatian connection has also been put forth since there is supposedly a grape known as Bouqettraube grown in very limited quantities in Alsace, but I can't find any reference to this grape outside of The Oxford Companion to Wine's article on Bukettraube itself. I'm not sure what the name means, but it looks like "bukett" is German for "bouquet," which this wine certainly has in abundance (the "traube" or "raube" of the rest may mean grape, but I do not speak German at all..."bouquet grape" or "aromatic grape" makes sense, though). Wherever it came from, it's pretty much limited to South Africa these days, though even there it's estimated that there are only about 88 hectares (217 acres) remaining. The wine is rarely exported because the flavors and aromas tend to fade away pretty quickly, so time is really of the essence when it comes to drinking Bukettraube. The wine I was able to find was the 2010 Cederberg Bukettraube, which is made from a tiny allocation of 6.5 hectares near the Cederberg Mountains in South Africa. 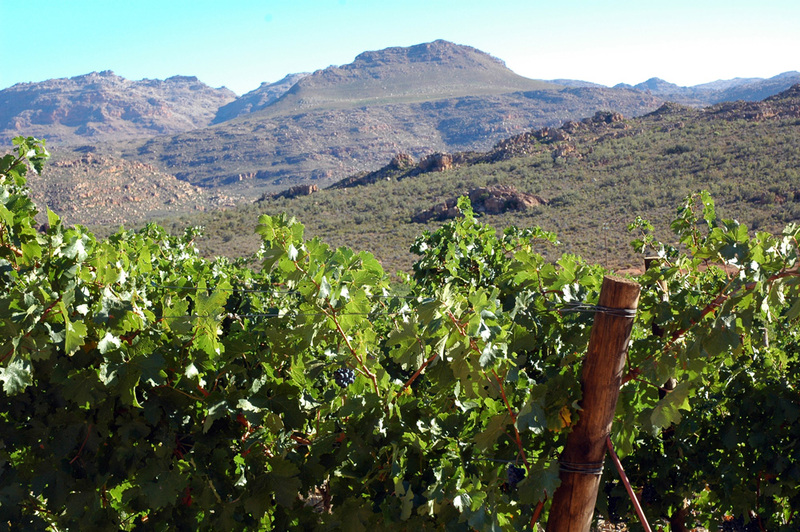 The Cederberg Mountains are a small, inland mountain range located about 300 km north of Cape Town. In the glass, the wine was a pale lemon-green color. The nose on this is explosively aromatic with very ripe grapefruit, white flowers, honeysuckle, stone fruit and lemon. On the palate, the wine is off-dry to medium sweet and is medium bodied with bright, zingy acidity. There are flavors of ripe grapefruit and honey along with ripe peaches and a bit of bitter grapefruit pith on the finish. The flavors are very pronounced, if not terrifically complex. This reminds me a lot of Muscat, though it has better acidity and more citrusy flavors than muscat tends to have. The intensity of the nose and palate are a bit of a surprise if you've had any experience with the parents of this grape. If I'd had to guess, I would have said this was a cross between Riesling and Muscat as it has the nice acidity and citrus of the former with the explosive aromatics and flowery stone fruit of the latter. This is a big, assertive, friendly wine that would be great with spicy foods. I actually enjoyed this most on its own while recovering from a hot, sunny day. If you're in the Boston area, I picked my bottle up at Curtis Liquors in Weymouth for about $20. Besides Brachetto d'Acqui and possibly Symphony, I don't know that I've really written very much about sweet or dessert wines. Even though I happen to be a fan of sweet wines, I don't drink or buy them that often. I think it's mostly because I've got this equation set up in my head where sweet wines = dessert wines, and the simple fact of the matter is that when I'm at home, I don't eat a lot of dessert. Cost is another factor as good sweet wines are usually made in a way that requires an awful lot of grapes to produce a little bit of wine, such as wines made from raisined, frozen or botrytis-infected grapes, which tends to result in higher prices. The spectrum of prices for sweet wines is much more compressed since they tend to start out higher on the low end than table wines, even if they flatten out faster at the high end. High end Bordeaux, Burgundy and California table wines can run you $5,000 right out of the gate while the greatest Sauternes wine (and, arguably, the greatest sweet wine on earth), Chateau d'Yquem, will probably run between $300 and $400 for a half bottle. Regardless of price, though, sweet wines definitely have their place at the table and I often find myself wondering why I don't drink more of them. All of this is in introduction to today's grape, Aleatico. 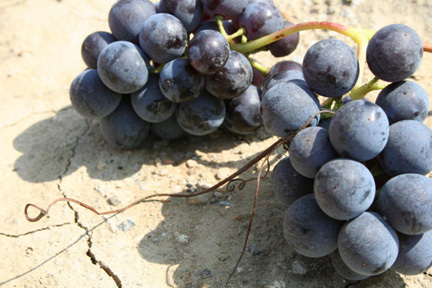 Aleatico is a red Italian grape whose origins are very unclear. There are written records dating back to the 14th Century which refer to the "Livatica" grape, which is commonly believed to be Aleatico (Livatica is also known as Liatico or Agliano so you put the two together and you get Aleatico). It was thought for awhile that Aleatico was simply a red-skinned mutation of Muscat Blanc a Petits Grains, but recently DNA research seems to point to Muscat as a parent to Aleatico rather than a mutation (the other parent was unable to be identified). The deep, intense color of Aleatico wines are also a big strike against the mutation theory, as the red-skinned clones of the Muscat family do not possess anything resembling the deep color of Aleatico. Nobody disputes that the grape has some link to the Muscat family of grapes, though, and once you try the wine, it's pretty easy to see why. Another point of confusion with Aleatico is the matter of exactly where it's from. 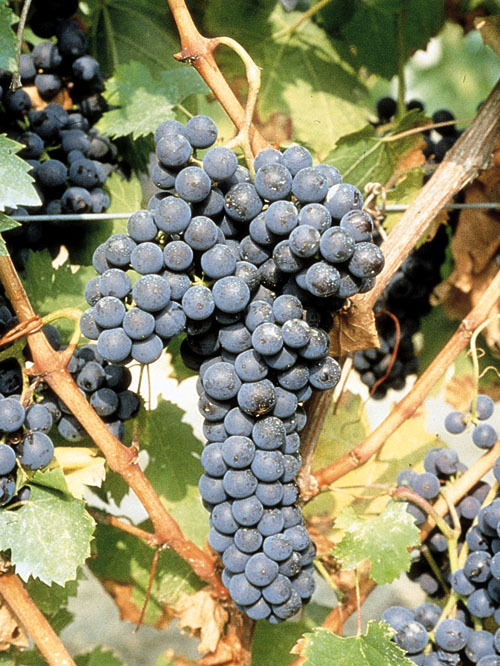 There are a lot of grapes growing in Italy today that at one point in time came over from Greece, but it isn't clear whether Aleatico is one of those grapes or not. There are some who maintain that it is a Greek import and others who claim that it's native to southern Italy (specifically Apulia). Whatever the case turns out to be, Italy is the grape's current home. There are a few DOCs and one DOCG scattered across Italy that showcase Aleatico. Most of it is grown in either Apulia, Lazio or Tuscany, though there are limited plantings in a few other Italian regions. Interestingly, Aleatico is one of the few grapes grown on the Tuscan island of Elba and wines made from the grape were purportedly one of Napolean's few sources of solace during his exile there. It is grown in limited quantities in other parts of the world like Chile, where it is known as Red Moscatel, and, surprisingly, in places like Uzbekistan and Kazakhstan. Aleatico plantings seem to be on the decline throughout Italy, but I was fortunate enough to come across the 2006 bottling from Nanerone called "Piandibugnano" Aleatico di Toscana IGT at Bin Ends for $29 (500mL). In the glass, the wine was an inky, dense, almost black color with a very narrow purple rim. The wine had a grapey, flowery aroma very similar to other muscat-based wines. On the palate, the wine was thick, but not syrupy, with nice acidity that was on the higher side of medium and, strangely, just a bit of fine, dusty tannin. The wine was definitely sweet with ripe purple grape flavors along with some lychee and boysenberry jam fruit. I had originally thought this might be lightly fortified, but have since learned (from my friends at The Wine Bottega) that this is in fact made in the passito method, where grapes are fully or partially dried before pressing. I was a little surprised, as this clocks in at 15% alcohol, but it carries it very well. The flavors here aren't particularly complex, but they're very intense and focused. My sum-up note reads: "kind of like port spiked with Welch's or flat grape soda," which is not a knock on the wine in any way as I found it very enjoyable. This is a home run with chocolate but has enough berry fruit flavors to complement a dark fruit cobbler or something in that vein. This is a very reasonably priced dessert wine that you should definitely try if you run across it. Lagrein is one of those grapes that slowly seems to be coming into fashion. Eric Asimov has recently written about it in his New York Times column, it was profiled on WineLibrary.tv a few years back, and it has started to show up in some email specials and even on some restaurant menus (one of the wines I'll be writing about below is from a local restaurant). While the interest the grape is generating may be a relatively recent phenomenon, the grape itself is anything but new. Let's get some history out of the way first: some sources say that Lagrein was first mentioned in print in the 17th Century, but other sources claim that mentions of the grape can be dated as far back as 1379 AD. For awhile, it was thought that the grape came over from Greece and that the source of the name "Lagrein" was either from the Greek word lagarinthos, which means "hanging," or from the Greek Colony of Lagaria in southern Italy. Today, most people seem to think that the name comes from the Lagarina Valley in Trentino, just south of Alto Adige. Whatever the source of the grape's name, its origin is no longer in doubt: genetic testing has shown that one of its parent grapes is Teroldego and it is a full sibling of Marzemino, both native Trentino varietals (Vouillamoz, J., & Grando, M. (2006) Genealogy of wine grape cultivars: ‘Pinot’ is related to ‘Syrah’. Heredity, 97(2), 102-110.). (**UPDATE** Lagrein's parentage has been confirmed as Teroldego x Schiava Gentile according to: Cipriani, G. et al. The SSR-based molecular profile of 1005 grapevine (Vitis vinifera L.) accessions uncovers new synonymy and parentages, and reveals a large admixture amongst varieties of different geographic origin. 2010. Theoretical and Applied Genetics. 121: 1569-1585.). These relations strongly indicate that the grape was born in the Trentino/Alto-Adige region. Today, it is extraordinarily difficult, but not impossible, to find Lagrein anywhere outside of Alto Adige. Australia seems to be the only other place on earth bothering with the grape, though production there is limited to a handful of producers (California has some vines, but nowhere near enough to be considered a player in the Lagrein game). The vine was once more widespread through Alto Adige than it is today, but it was supplanted by Schiava to a large extent. Both Schiava and Lagrein are capable of very high yields, and while I've read that Schiava was supplanting Lagrein because of its greater resistance to disease, my feeling is that fashion probably played a larger role. The focus on denser, darker red wines is largely a product of recent history as, traditionally, most red wines were fairly light in body and color (many historians think that the great "clarets" from Bordeaux in the 17th and 18th centuries were closer to modern day rosé wines than red wines). In general, Lagrein is not a light wine and it has the double-whammy of high acidity and very high tannins. My feeling is that Schiava was more widely planted because the wines produced from the grape were more approachable and user-friendly than the wines being made from Lagrein. A good deal of the Lagrein production was used to beef up the Schiava a bit, as Schiava can be bewilderingly light in color for a red wine. It's also somewhat telling that, for quite awhile, Lagrein was more lauded for its ability to produce an excellent rosé than for its ability to produce red wine (it still has a great reputation for rosé production, though it is much more difficult to find rosé wines made from it than regular red wines). Current fashion has swung in the opposite direction and today's consumer is more interested in denser, heavier red wines with more body and fruit. While Lagrein does have high acid and high tannin, it also has the great equalizer of intense fruit concentration that can round out the sharpness and provide a lot of flesh on the otherwise pretty angular skeleton that the Lagrein grape carries around. The key, though, is a focus on quality in the vineyard. As mentioned above, Lagrein has the capacity to yield explosively but when allowed to do so, the fruit gets diluted and the structure sticks out in all the wrong places. Canopy management and restricted yields are especially key for producers who are looking to produce quality wines from Lagrein. Many producers are heeding the call, though, and Lagrein is starting to take back some of the vineyard area from Schiava and to generate more of a buzz in the international community. The first wine I was able to try is one I found on a local restaurant wine list. Sel de la Terre was offering the 2003 vintage of the Abtei Muri-Gries Riserva for $40 a bottle when I was there in April 2011 (the picture on the side shows the 2000 vintage because I wasn't able to snap a picture in the restaurant and this was the best looking label I could find). I jotted my notes down on some scrap paper so this isn't a complete tasting note, but the bottle was so good I definitely wanted to be able to write about it here. The lighting in the restaurant was pretty dim, but the color on this wine was an obvious, dense, inky purple color. The nose was pretty shy on this and never developed very much. On the palate, though, the wine was full, dense and richly extracted with acidity on the higher side of medium and grainy tannins. The palate was full of rich, ripe purple fruits and nice earthy, leathery notes. It was broad and very well balanced with a medium finish. This wine is produced in a monastery in Alto-Adige from three different estate vineyards that only total 9 hectares. Some of the vines on these estates are 80+ years old. The wine is stainless-steel vinified and then aged in wooden barrels (probably some new oak, but I doubt it's 100%) for 16 months prior to release. The second wine I tried was the 2009 Georg Mumelter Griesbauerhof which I picked up for $22. Again, the wine had a deep, inky purple color with a generous nose of crushed blackberry, blueberry, black cherry with some jammy notes to it as well. The palate was full bodied with nice acidity and plush, ripe tannins. There was smoky black cherry and blackberry fruit with some earthy leather rounding it out. This was a bit more polished than the Muri-Gries, but really lacked the complexity and depth of flavor of that wine. The finish comes up pretty short on this bottle, but overall, it's a very good effort. Barbeque is the first thing that comes to mind for me with these wines, as they have the structure and the fruit to stand up to smoked meats and heavy sauces. I almost hate to say it, but a good comparison here is with well-made Australian Shiraz as they both have that dense core of primary fruit with nice acid and enough tannin to prevent them from tasting like fruit soup. If you run across Lagrein in your local shop, give it a shot and serve it with your next cook out. I was recently able to track down a bottle of the 2009 Muri-Gries Rosato made from 100% Lagrein grapes in the Alto Adige region of Italy. I picked this bottle up from my friends at Curtis Liquors for about $8. In the glass this wine was a bright cherry red color reminiscent of maraschino cherry juice. The nose was somewhat reserved with red cherry and fresh cut strawberry fruits. On the palate the wine was on the fuller side of medium with fairly high acid. There were flavors of Rainier cherry and sour cherry along with some fresh cut strawberry and touch of watermelon. The flavors were a little bit washed out and muted here, as this wine is probably not meant to sit around for a few years before having its cork pulled. This wine does typically retail for about double what I paid and I knew when I bought it that it was an end-of-the-vintage sale and that it might not be showing its best. I did still find it enjoyable and thought that it was miles better than most rosé wines at this price point.